This is a case study of an application for leave to appeal to the Queensland Court of Appeal against a sentence imposed by the District Court of Queensland. The decision in the appeal stated important principles for sentencing of serious environmental crimes done for commercial gain. Between 20 December 2000 and 2 January 2001 a commercial timber-cutter, Brett Dempsey, illegally cut down and removed 25 large trees from the Wet Tropics World Heritage Area in the Upper Barron River near Herberton in North Queensland. The largest tree felled was estimated to be over 300 years old and most were over 100 years old. When sold at auction the timber yielded $45,000. The offences were discovered following reports by residents of suspicious activity in the area - vehicles had been seen and heard at unusual times. On 1 January 2001 this activity was reported to a forestry ranger, along with the registration number of a vehicle owned by Mr Dempsey. The forestry ranger discovered heavy equipment in the forest, including a skidder (which is used to push trees) and a caterpillar loader. He went to Mr Dempsey's home to investigate further. Mr Dempsey denied any knowledge of the incident and gave false information to the officer about the whereabouts of his prime mover truck. 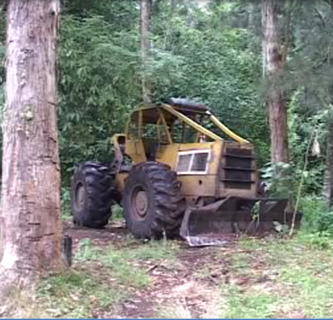 The forestry ranger then discovered that the skidder had been removed from the forest. However, a trail of debris led to a residence at a nearby town, where the vehicle was discovered and seized. Further investigation by the forestry officer led to a nearby quarry where he discovered the 25 logs had been buried in a 1 metre deep pit. Mr Dempsey was charged with an offence against section 56(1) of the Wet Tropics World Heritage Protection and Management Act 1993 (Qld) and a further count of stealing contrary to section 398(1) of the Criminal Code (the latter offence was because the trees taken were in a national park and therefore the property of the State of Queensland). Mr Dempsey pleaded guilty on the day of the committal hearing and was later sentenced by the District Court to one year imprisonment for each count, to be served concurrently. These principles are important for sentencing serious environmental crimes done for commercial gain. Appeal filed by applicant (Mr Dempsey). Outline of submissions by applicant. Outline of submissions by the respondent (the Crown). Decision of the Court of Appeal dismssing the appeal: R v Dempsey  QCA 45. Order of the Court of Appeal. 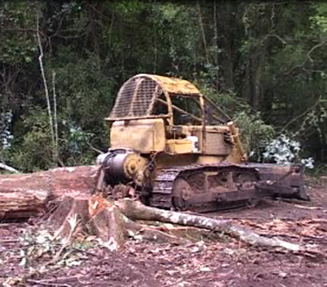 Bulldozer with felled tree in rainforest. 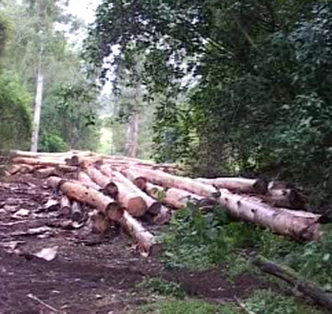 Images courtesy of the Queensland Environmental Protection Agency from footage taken in the R v Boyle prosecution of logging in a World Heritage Area in South-East Queensland (i.e. these pictures are not from the R v Dempsey case). Thanks to the Office of the Queensland Director of Public Prosecutions for supplying the indictment for this case study and to the Supreme Court registry for supplying the appeal documents.